The Sugar Shack is passionate about the quality of their candles. The estimated burn times for the sixteen ounce size is from 100-120 hours, the eight ounce 50-60 hours depending on the fragrance. Our candles are made from a high quality paraffin with all cotton wicks. 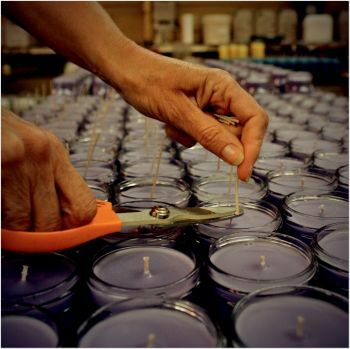 All candles or packaging of the candles have a caution and candle maintenance label on them. However, we will review them here for your information. Failure to trim your wick will cause smoking with any candle. We suggest trimming your wick to 1/4 inch before lighting and whenever the flame is too high. If the wick gets too long during the burning process, blow it out and trim again. Centering the wick will help ensure a clean even burn. Always keep candles away from any drafts. Further candle care includes burning your candle until the top has totally liquified to the edges of the jar. This will help insure any even burn every time you light your candle. Discard candle when 1/2 inch wax remains. Keep wick trimmings, matches and other foreign matter out of the candle. Never leave a candle burning unattended. Keep away from children and pets. Always burn candles in an open area on a heat resistant surface and away from flamable items. The candle may become hot, so handle with care. Failure to follow instructions could result in a fire hazard.